Editor's Note: A version of this post originally appeared on the Huffington Post. Is that right, Mr. President? Then why is your administration proposing to slash as much as 25 percent of the Environmental Protection Agency’s current budget and cut its staff by 20 percent? That would cripple environmental safeguards, jeopardize public health, and put future generations at risk. The EPA has made remarkable progress cleaning up air and water pollution since its inception in 1970, but there is still more work to do. In 2015 alone, polluters dumped more than 190 million tons of toxic chemicals into waterways nationwide; at least 5,000 community drinking water systems violated federal lead regulations; and some 116 million Americans lived in counties with harmful levels of ozone or particle pollution, which have been linked to lung cancer, asthma, cardiovascular damage, reproductive problems and premature death. If anything, the environmental challenges of today suggest that the EPA needs more money and staffing to carry out its congressionally-mandated mission, especially since Congress has already reduced the agency's budget by 28 percent in real dollars to $8.14 billion between fiscal years 2010 and 2016, a paltry 0.20 percent of the projected $4 trillion fiscal year 2017 federal budget. For his part, EPA Administrator Scott Pruitt doesn’t seem particularly fazed by the prospect of his agency having to make do with lot less, claiming that state environmental agencies can pick up the slack. As he explained during his Senate confirmation hearing in mid-January, he believes “state regulators … oftentimes best understand the local needs and the uniqueness of our environmental challenges,” and, as far as he’s concerned, they should shoulder the primary responsibility for enforcing the law. But can state environmental agencies really compensate for an eviscerated EPA? If anyone understands the relationship between the EPA and state environmental agencies, it’s Carol Browner, who served as EPA administrator during the Bill Clinton administration after running Florida’s Department of Environmental Regulation. She said state agencies are simply not equipped to take on the burden of federal functions. I put that question to Ellen Gilinsky, who spent the last six years as an EPA water program policy adviser. Before joining the EPA, she was director of the Virginia Department of Environmental Quality’s water program. “States totally depend on the grants they get under the Clean Water Act, Clean Air Act, the Safe Drinking Water Act [and other federal environmental laws],” Gilinsky said. “Fifty to 60 percent of the funds for the Virginia water program came from the EPA. If we had doubled our permit fees to help fund our water program, we still wouldn’t have covered the cost. And if we had, the business community would not have appreciated higher permit fees. Ken Kimmell, who ran the Massachusetts Department of Environmental Protection (Mass DEP) before becoming president of the Union of Concerned Scientists in 2014, also stresses the importance of EPA technical assistance, as well as its state grants, which comprise a significant chunk of the agency’s annual expenditures. In fiscal year 2016, those grants amounted to nearly 45 percent of the agency’s budget. Massachusetts isn’t the only state that has had to tighten its belt. Forty state environmental agencies have reduced staff in recent years, according to an October 2016 report by the Center for Public Integrity. Since 2007, staffing at environmental agencies in Illinois and Arizona dropped by more than a third, in New York by nearly a quarter, and in Michigan and Florida by a fifth. With state cutbacks like those, there’s a clear need for more support from the EPA, not less. But EPA’s staff has shrunk by 10 percent over the last decade, from 17,000 in 2007 to about 15,000 today, and President Trump’s proposed budget would reduce it by another 20 percent, to about 12,000. It hasn’t been that small since the mid-1980s. By comparison, nearly 100,000 people work at the Agriculture Department, nearly 47,000 are at the Commerce Department, and nearly 78,000 are at the Department of Health and Human Services. Another reason why state environmental agencies depend on the EPA is because, as Delaware Sen. Tom Carper painstakingly explained during Pruitt’s confirmation hearing, pollution does not honor political boundaries. Moreover, corporations may own polluting facilities in several states or a facility that emits pollutants into several states, making it difficult for a lone state agency to police them. Schaeffer also pointed out that states have little incentive to take action against major polluters within their own borders if their emissions wind up somewhere else. To make matters worse, some governors and other state officials seem more interested in protecting polluters than their own citizens. But Scott did much more than just “weaken” enforcement. He virtually eliminated it. In 2015, the Florida DEP opened 81 percent fewer enforcement cases than in 2010, according to an analysis of state records by Public Employees for Environmental Responsibility (PEER). Case outcomes, meanwhile, were worse than in nearly any previous year. The Florida DEP collected the lowest number of fines in 28 years, PEER found, and assessed no penalties in a third of the cases. Of all people, Gaetz should know better. Before winning a seat in the U.S. House of Representatives last fall, he served in the Florida Legislature, taking office in 2011 — the same year Scott became governor. He had a ringside seat when Scott took an ax to the DEP. Pruitt also should be well aware that a governor — or other state officials, for that matter — can run roughshod over environmental protections. After all, he did it himself. 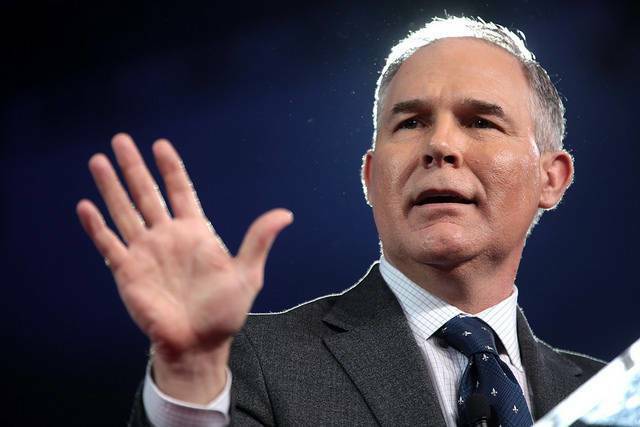 As Oklahoma’s attorney general between 2011 and 2016, Pruitt dismantled his office’s Environmental Protection Unit, halted efforts to reduce poultry manure in Oklahoma waterways, and sued the EPA 14 times to block stronger air, water and climate safeguards, including standards that would reduce regional smog and airborne mercury pollution. Pruitt also stood idly by while hydraulic fracturing made Oklahoma the most earthquake-ravaged state in the country. Although Pruitt’s office does not regulate oil and gas development, he could have intervened to protect residents, for example, when their insurance claims were denied. And like Pennsylvania’s attorney general, he could have investigated — and prosecuted — frackers for violating environmental laws and polluting the water supply. He did nothing. Wisconsin Gov. Scott Walker cut the Department of Natural Resources (DNR) budget by $59 million since taking office in 2011 and eliminated nearly 200 positions, including half of its scientists. Last June, state auditors found the DNR doesn’t follow its own enforcement policies to protect state waters from livestock, factory and sewage treatment plant pollution. West Virginia Department of Environmental Protection is not enforcing state coal mining regulations, according to a three-year investigation by the U.S. Interior Department. The report found the agency routinely fails to monitor water quality, enforce reclamation standards, or ensure mountaintop removal doesn’t trigger local flooding. North Carolina state legislators have stymied efforts to clean up electric utility coal ash dumps, reduced the state’s Department of Environmental Quality staff by a third, and instructed DEQ regulators to soft-pedal the enforcement of air pollution standards. Recent polls indicate that a majority of Americans support a robust federal environmental regulator and stricter environmental safeguards. According to a Reuters/Ipsos opinion survey released in mid-January, more than 60 percent of Americans want the EPA’s authority preserved or strengthened under the Trump administration. Interestingly, nearly half of the respondents who identified themselves as Republican — 47 percent — agreed that the EPA should either “remain the same” or “be strengthened or expanded.” Meanwhile, a December 2016 poll conducted by the Pew Research Center found that 59 percent of Americans believe stronger environmental regulations are worth the cost. The administration’s plan to wreck the EPA, however, belies Pruitt’s populist rhetoric. Reading between the lines, Pruitt’s vow to empower “the people” really means empowering corporations, which, after all, are considered people under the law. And when he says his agency is going to “advance freedom,” he’s really talking about advancing the freedom to pollute.